The picture of hunger in America is changing. In the past, hunger may have conjured up images of gaunt faces or rail-thin children. 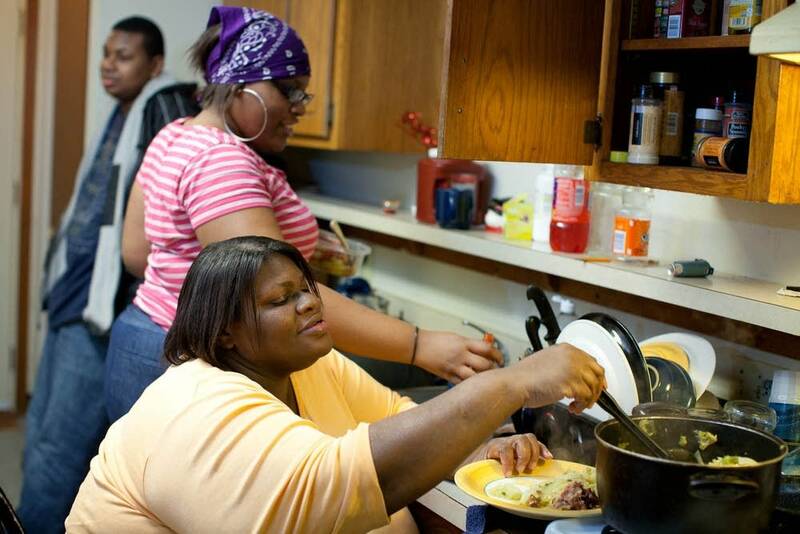 Today, some people who struggle to feed their families are actually obese. It's a paradox that researchers are trying to untangle: How can people be both hungry and overweight? Gwendolyn Smith worries about a lot of things — including food. Sometimes, she doesn't have money to buy enough for the month. "Basically like two weeks, at the end of the month, we usually run out," Smith said. She's a single mom, and her kids mean everything to her. In the past, when food has been short, she has skipped meals. "If I didn't have enough, then I would make sure that my kids ate," Smith said. "And I would just get me a cup of water." On a recent night, she pulls pork chops out of the oven. It is still early enough in the month that she has meat. "Peanut, can you get me a skillet?" she asks one of her children. Smith, 46, can't easily grab that skillet herself. She weighs 383 pounds, so it's hard for her to get around. She used to work, and volunteered at her kids' school, but now she has congestive heart failure. Losing pounds is a priority for her, but she's not able to afford all the healthy options. "And then if I do buy yogurt or fruit or milk, it's gone in one day," she said. That scarcity has changed how she eats. Sometimes, when food becomes available, she eats more than she should. "If you don't have a lot of food, whatever you get, you gonna try to eat enough so that you can be filled up, because you might not know when you'll get your next meal," she said. Weight has long been a struggle for Smith. She grew up in poverty, and her father was obese. But she blames herself. She says she ate far too much junk food, sometimes for comfort. "If I'm angry or just lonely, it soothes for a little bit," Smith said. "And then you go back to being sad and lonely." At the Hennepin County Medical Center, where Smith is a patient, families check in at the pediatric clinic. Dr. Diana Cutts sees many families who struggle with both hunger and obesity. "I think it is way more common than we would have ever, ever imagined," Cutts said. Cutts admits that when she first realized hungry patients could be overweight, it didn't add up. "But there it was, in front of my eyes, and so then I had to do a lot of thinking about — how can you make sense of that?" She hears clues about what's going on, from families who settle for less healthy food because it's cheaper. And she sees that high-fat food can be a reward. "For families who have very little, this becomes a reward that really has meaning and is yet affordable at some times," Cutts said. "And I think just in general, the meaning of food becomes so loaded when access is restricted." The research shows obesity and what is known as food insecurity — or inconsistent access to enough healthy food — coexist only in women. But Cutts suspects there's a link in children, too, and is looking for the best ways to intervene. Propelled by doctors like Cutts, researchers are asking why these two conditions coexist. Their findings paint a complex picture that goes beyond food choice. Recent research from the University of Minnesota finds parents who struggle to get enough food eat fewer fruits and vegetables and drink more sugar-sweetened beverages than other parents. That is largely due to poor access, said Mary Story, a dietician in the University of Minnesota's School of Public Health. "What we know is that fruits and vegetables cost more, whole grains cost more," Story said. "And many low-income people live in neighborhoods or communities that lack access to a supermarket." That, she says, can push people toward pasta and white bread. "If you are a parent, and you have a limited amount of money and you're trying to feed a family, what choices do people really have?" she asked. But scientists are learning diet is only part of the story. Cornell University professor Christine Olson has for years been studying the link between obesity and food insecurity. Before others were paying attention, she was carrying scales around New York state, weighing low-income women. Patterns of eating matter, Olson argues. If a mother eats less because food is scarce, that period of famine reduces the number of calories her body needs. "So then, if food becomes plentiful, and you eat the same number of calories that used to be fine for you, your body is more efficient, so it will convert some of that extra energy to fat." Olson said. In other words, it's not just what people put in their bodies, but what their bodies do with that food. Stress is one other factor that can't be ignored, researchers say. Scientists are still piecing together how stress may lead to obesity. "Clearly, as an adult, not being able to feed yourself and your family is highly stressful," Olson said. Some animal studies suggest that stress not only tells our bodies to eat more, but also instructs our bodies to store the extra as abdominal fat — exactly the kind doctors hate to see. Back in her home in Minneapolis, Smith is taking steps to improve her family's health, trying new recipes the doctors gave her. She used to cook a lot of pasta and fried chicken. Tonight the family ate baked chicken with vegetables. Smith's nine-year-old son, Gerald, is giving that his best shot. "I'm trying to start eating salad. I don't really like salad. But I like the croutons," he said. Smith hopes Gerald will break the cycle that goes back at least two generations in her family. And he knows that's why they're eating vegetables.
" 'Cause she wants me to be healthy, and not like her." Smith has lost 36 pounds since April. She wants to be down to 200 by the time her daughter graduates from high school next year.